The remake of Splatterhouse has kind of fallen off the map after the game went through all those publishing issues. Then it got delayed yet again. It’s been quite a bumpy ride for the blood soaked brawler, but here we have some good news surrounding the game. That shoe up there is an actual shoe that you can buy and you can buy it now. Evidently, the shoes didn’t get the message about the game being delayed almost a year. 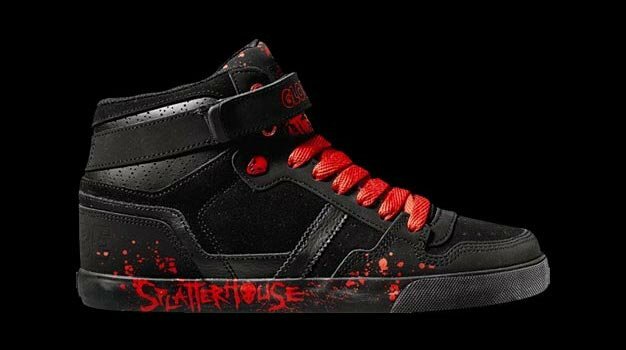 Made by GLOBE International Limited and based of their Superfly model of shoe, that blood splattered beauty is the Splatterhouse Co-op limited series shoe. You have to dig the stylish skull/hockey mask things on the show, that’s for sure. The shoes are on sale now at select retailers. Just make sure that when you wear them you don’t hide the Splatterhouse logo across the bottom of the shoe or people mike think you’ve been skipping through puddles of blood.